It was just about three years ago when we reviewed the original version of the Pilot Omni Air Over Pants. The Omni Air Over Pants V2 have a few updates from the originals, with a small $15.00 price increase. I’ll point out the differences in this review, but note that I (Brandon) have no experience wearing the original Omni Air pants. 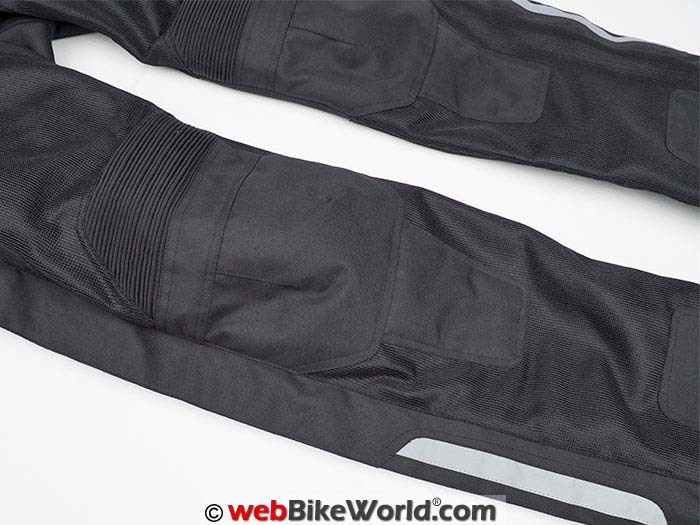 Like the other Pilot motorcycle garments we reviewed, the Omni Air Over Pants V2 offer good value for the money. Large areas of the pants shell have a mesh weave and potential impact zones are covered with solid textiles for durability. This strikes a good balance between airflow and protection. Version 2 of the Omni Air Over Pants include upgraded knee protectors and a removable REISSA membrane liner is included for water- and wind-proofing. That makes these over pants suitable for more than just hot weather use. If these pants look familiar, that may be because we reviewed the first generation nearly three years ago to the day. Although Pilot has made many changes to the Omni Air pants since then, the outward appearance is very similar. I didn’t own a pair of the original Omni Air pants so it’s a bit difficult for me to make a direct comparison, but that is also good in that I have no specific expectations in mind. I do, however, have a list of features that have been changed from the first generation and I will call these out as I progress through the review. However, two things I can note right away is an upgrade to the Pilot “Core Force” knee protectors. Also, Tall lengths are now available in sizes from M to 2XL. It has taken a little longer than usual this year but the heat of late Spring and early Summer has finally arrived here in the Southeast United States. This means daytime temperatures are climbing up to and even over the 90 degree (F) mark (32 C) and with that comes the opportunity to wear the latest mesh gear from Pilot Motosport. 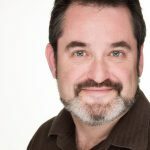 I recently reviewed the Pilot Direct Air V3 jacket and was very pleased with the way it was put together and how it balanced cooling air flow with protective features. 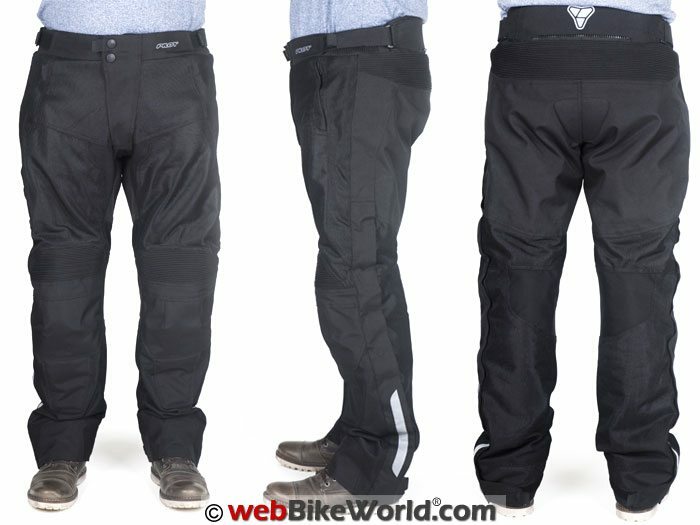 These updated “V2” Omni Air Overpants would be the obvious choice to mate with that jacket to create a nice hot weather motorcycle riding outfit. Nearly the entire outer shell of the Pilot Omni Air Over Pants V2 is deep black in color and that is the only color offered. According to Pilot, the 600D non-mesh sections of the pants use a different material than the previous version but I’ll have to take their word for it, as I can’t notice a difference from comparing the photos of the V1 and V2. The only areas that aren’t black are the reflector patches on the lower legs; the three sided pilot graphic on the rear waistband and the small Pilot logo on the front waist band. This follows with Pilot’s subtle branding practice. There aren’t loud, shouty graphics or large emblazoned logos across the pants; form follows function is the order of the day here. The pants are composed of about 60 percent (my guess) mesh with the rest made from solid textile, which seems a bit more than the 40 percent we mentioned in the review of the original version. The mesh weave is on the smaller side compared to some other pants I’ve worn, such as the Joe Rocket Phoenix pants (review). Since these are Over Pants, full length (or nearly so) YKK zippers are in place on the outside facing sides of the legs and they run from the leg opening all the way to about 14 inches (35.5 cm) from the top of the waistband. Zippered legs like this make it easy to put the pants on without needing to remove your boots. The zipper is covered by a flap of material closed with hook-and-loop. It’s one long continuous piece, stretching 29 inches (74 cm) if it’s opened all the way to unfasten the zipper. Add to that the fact that the hook-and-loop holds very securely and you’ll need some extra time to undo everything to get in and out of the pants. However, long runs of hook-and-loop like that are commonly found on anything called a motorcycle over-pant. Some companies like Joe Rocket have made pants entry and exit easier by using hook-and-loop spaced in intervals, like in the Joe Rocket Ballistic 7.0 pants (review). An adjuster is in place at the leg opening to allow the leg cuff opening to be tightened to fit around your motorcycle boots. It’s a a 3 inch (7.5 cm) textile strap, fastened with more hook-and-loop. The opening can be adjusted from the 18 inch (48 cm) maximum down to 12 inches (30.5 cm). At the waist are two adjustment straps on either side that provide 3 inches (7.5 cm) of adjustment for a total of 6 inches (15 cm) of range. This wide range adjustment should allow these pants to accommodate various types of street pants underneath, from lightweight khakis to jeans. The front main closure at the waist uses a pair of vertically stacked, rubber coated snaps, a YKK zipper and a 3 inch (7.5 cm) section of hook-and-loop. This should provide a secure hold, although I would still like to have a metal hook or other solid fastener for the waist, as this location can get stressed when you’re in the seated position on the bike. All of the adjustment straps and the front closure flap have elastic strap pulls attached to make it easier to grasp when wearing gloves — one of those little extras features that I’ve become used to finding on Pilot clothing. 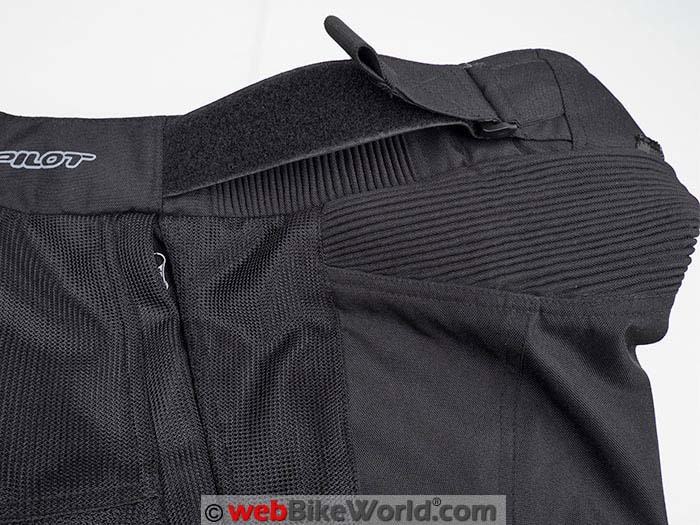 These elastic pulls are new for this update to the Omni Air Over Pants and it may be a small detail but it’s also very useful and missing from other brands of motorcycle riding pants. Two zippered pockets are located at the front and they are large enough to handle a wallet or mobile phone, although a large smartphone tends to be uncomfortable in any pants when placed in the front pocket. 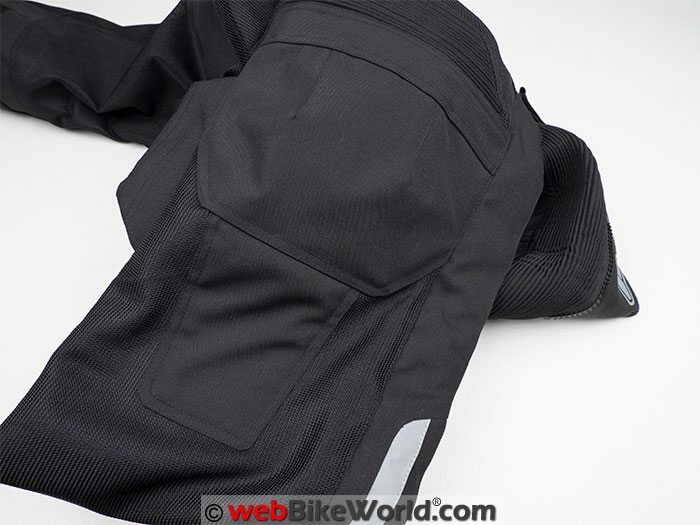 The pockets are not waterproof because they are made from the same mesh material as the pants. The 6 inch (15 cm) zippered opening for the pockets is a bit small to fit my medium-sized hands when I’m wearing gloves, so larger hands will definitely be a squeeze. Since these are over pants, it would have been nice if they designed a zippered opening to pass through to the inside to access your jeans pockets. 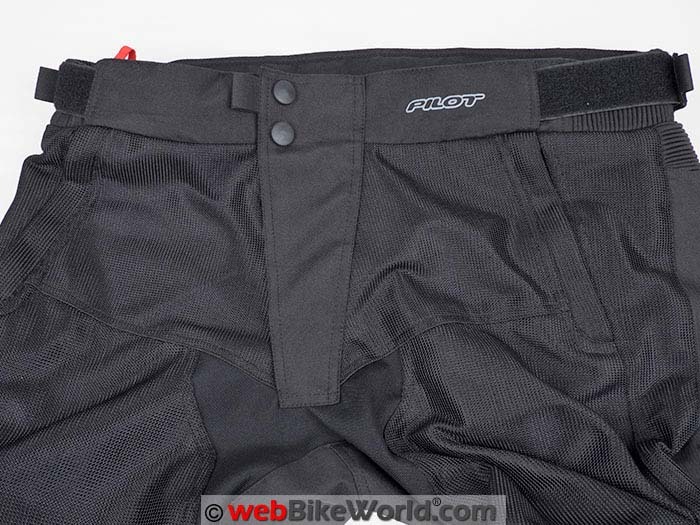 Like the other Pilot gear we’ve reviewed recently, Pilot has included their RedTab feature set in these overpants. This consists of bright red tabs and “markers” placed in various places inside the pants at certain points, to help the wearer quickly identify attachment points. In the waistband are two red reinforced strap points designed for use with Pilot’s own V-Brace suspenders. The bright color makes them easy to find inside the otherwise black interior. The rear hang loop and two side hanger loops are also easy to find in their bright red color and there is a bright red tab on the opening to the knee protector pocket making even this infrequently accessed spot easier to find as well. 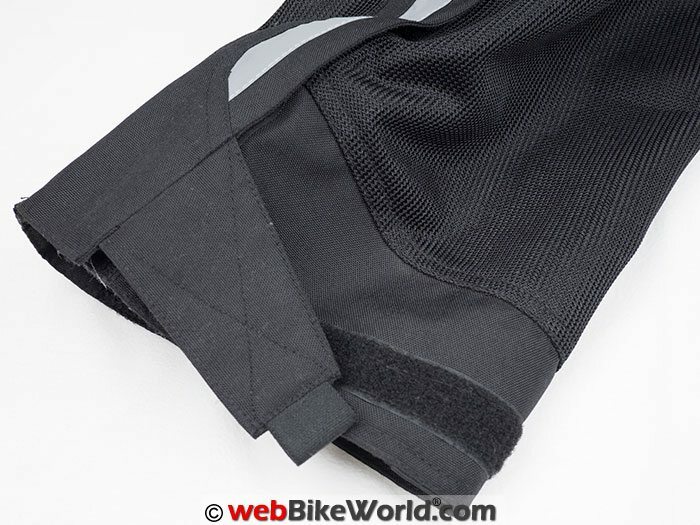 Knee protector pocket with height adjusters. 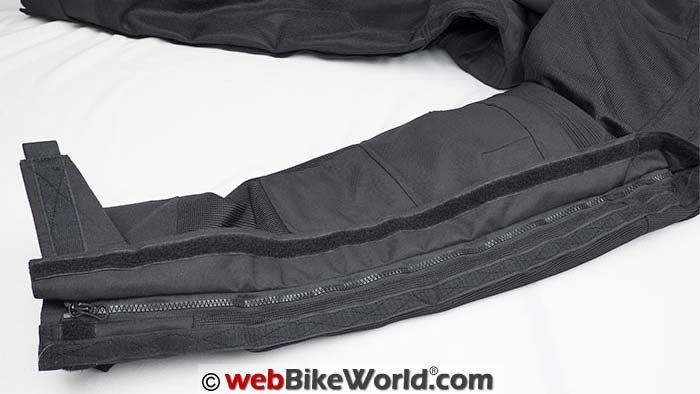 Pilot Motosports uses a self-branded textile for their technical riding gear. 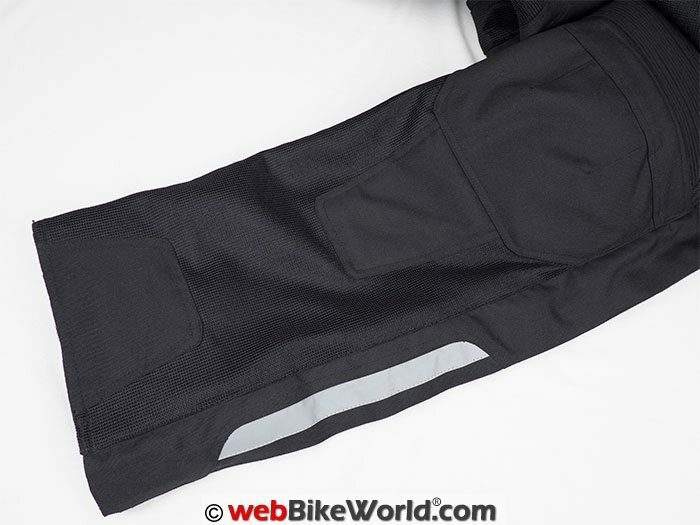 The mesh material used in the Omni Air Overpants V2 is called Pilotex 210D and it has a dense interlink with a smooth texture that feels dense. Fortunately, Pilot has lined the pants with a soft open weave polyester mesh to make them more comfortable against the skin in case you’re not using them as over pants. In impact areas such as the knees and seat, Pilot 600D NPF material is used for extra abrasion resistance. 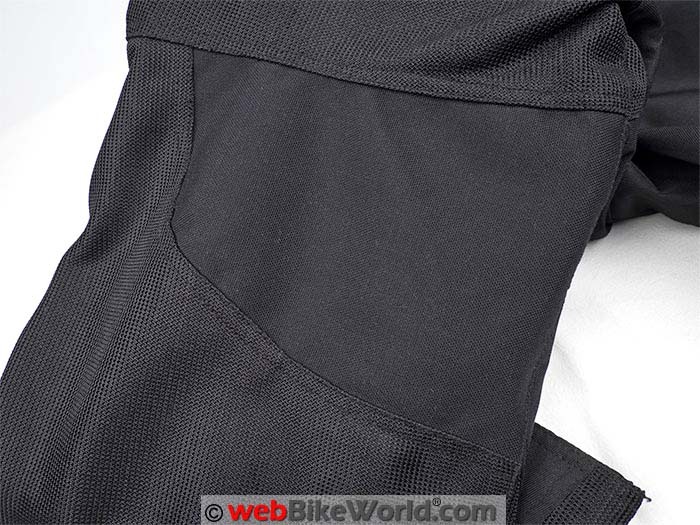 This 600 denier fabric looks and feels a lot like Cordura fabric and has as similar texture. Behind the knees and in two smaller panels in the crotch is a 1000D material called Flexdura. This material is supposed to be a stretch type (hence the name) but the stretch is pretty minimal and is only in one direction. It feels tough enough to do the job but don’t expect a lot of stretch like Spandex here. On the subject of stretch, accordion style stretch panels are in place above both of the knees for better fit in the riding position. Another stretch panel sits in the back underneath the waist and sits below the pants attachment zipper. All the various panels are well stitched together and use double and triple stitches in certain areas for added strength. The overall stitching is tight and uniform, which I’ve come to expect from Pilot apparel. YKK zippers are used throughout the pants and are of the larger coil types everywhere except for the liner attachment points. The pull tabs are medium sized and I’d like to see a larger tab or an additional leather or textile pull to make them easier to operate when wearing gloves. I want to point out that the leg zippers on the previous Omni Air over pants were of a smaller variety, while the zippers on the Version 2 pants are referred to as “EZ PULL” by Pilot, suggesting these might be a bit easier to use. They definitely have larger teeth, judging by our photos from the previous review. Pilot has upgraded the knee protectors in the new Omni Air Overpants V2, which now use their “Core Force Active Armor”. The CE approved protectors are made from a polyurethane based foam that hardens on impact but is pliable when flexed slowly. However, the hip padding included with the pants is the more basic foam style of the type found in the Dura over pants we reviewed. It’s perforated, so it doesn’t block as much air flow as a solid pad. Pilot offers their own optional “Core” hip protectors that can be purchased for $30.00. Both the knee protectors and hip pads are contained in hook-and-loop fastened pockets, so the pieces can be easily removed or upgraded and the knee pockets allow three different height adjustments to provide a custom fit for the wearer. Pilot also includes a tailbone protector pad in the seat of the pants, which is nice also. This is usually standard on racing leathers but not always found on street riding pants. The tail bone pad isn’t that thick but it is certainly better than nothing. The knees and shin are covered with a double layer of the 600D material and the seat and rear upper legs get the same treatment for extra abrasion resistance. I consider visibility a protective feature also and here I think Pilot could step it up a bit. First, I would like to see a silver or white option available for the pants fabric, which could improve daytime visibility. Lighter colors would also absorb less heat energy from the sun, keeping the pants cooler. Secondly, some additional reflectivity for nighttime use would be welcome. There are two strips of 3M Scotchlite on the outside of the ankle areas, which works well enough but I’d like to see some additional reflective patches or even piping elsewhere on the pants. My Omni Air Over Pants V2 are size L, regular length and according to the Pilot size chart, they should fit a 34 to 36 inch waist. I have a 36 inch waist and I can wear these over my jeans with a comfortable fit, so I’d say the sizing is correct. The pants even have some room to spare, so they could maybe cover a 37 to 38 inch waist without much trouble if the waist adjusters are let all the way out. So the bottom line here is that you can probably purchase the pants based on your regular pants size and you’ll probably be able to wear the Omni Air pants alone or have enough extra room for use as over pants. By the same token, the size L should fit a smaller waist size, down to a size 34 easily and because there’s so much adjustment available, the pants might even be able to go a bit smaller. Assisting this wide range of fit are the accordion stretch panels in the waist under each adjuster, which helps reduce bunching of the waistband for smaller sizes. The good news is with all of this adjustment available, you should still be able to wear a variety of different types of pants under these with little trouble. The standard inseam for the size L pants is 33 inches (84 cm) and my tape measure shows this to be exact. The photos demonstrate that the pants look a bit long for my 30 inch inseam when I’m standing but on the bike, they look less so, although a short version of the pants might be a nice option for some of us. Despite the extra length however, the pants aren’t too loose on me and overall the Omni Air V2 over pants have a slimmer cut than other over pants I have owned (including my Joe Rocket Ballistic 7.0 pants). Also, the Omni Air pants have the same type of cut and fit as the Pilot Dura over pants I reviewed earlier this year, which is a good feature as apparel can often fit very differently from style to style from the same manufacturer. Air flow through the mesh panels on the Omni Air Over Pants V2 is good and what I would expect from looking at the mesh fabric. Pants with a larger weave might offer better air flow, but I think there is a point where durability and protection can become compromised. The ventilation through these pants works well, especially at the tops of the thighs but to a lesser degree on the knees and shins, due to the solid textile in those locations. Depending on your motorcycle type, the reduced air flow in the shin area can be a blessing, however! My Ninja 1000 can put out some heat during warmer days that is directed right around my shins, so more ventilation in that part of the pants isn’t always a good idea and solid fabric helps deflect some of that heat. 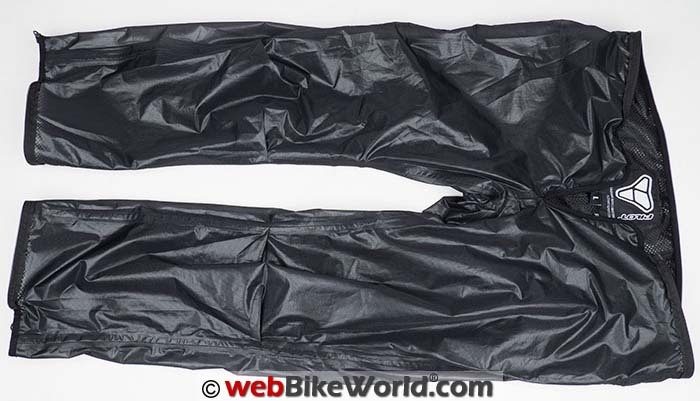 A waterproof REISSA liner is included with the Omni Air pants and according to Pilot, this is new for the V2 version but…our review of the original Omni Air pants appears to have the same liner, so I’m not sure. Perhaps the original liner wasn’t REISSA? In any case, the REISSA membrane is light and feels delicate. 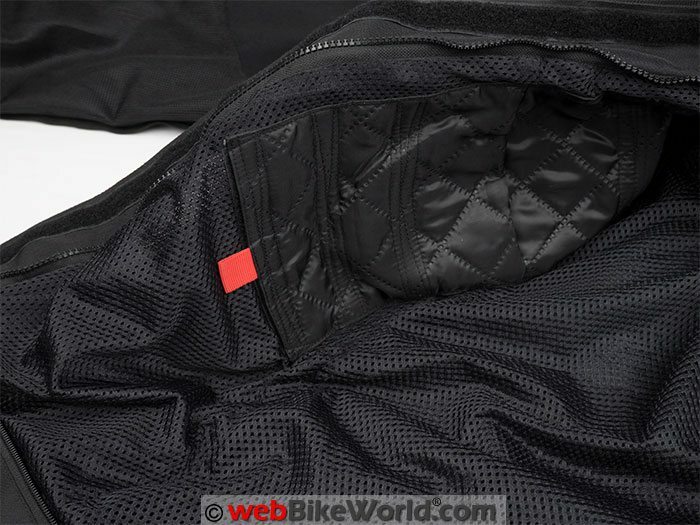 To increase durability, Pilot has added a mesh lining to the inside of the liner, just like the Pilot Direct Air jacket V3 we reviewed. The nice thing about these liners is since they are so thin and light, they can be easily stowed in small places like a smaller side case or top box or even a tank bag. I tested the REISSA liner by letting a portion of it sit for several hours draped over a bowl while water was allowed to puddle in a depression I made in the middle of the liner. After four hours, no water came through the liner, so that’s a very good performance and typical of my experience with REISSA membrane liners. One thing to note, the liner does not have full length leg zippers like the pants, so you won’t be pulling these on over riding boots or shoes. Also, any of these “breathable” liners can only allow moisture to evaporate and they block air from coming through, so expect to feel a bit stuffy if you are caught in the rain on a hot day. After reviewing several items of clothing from Pilot recently, I am pleased to report that the consistency in quality and fit overall is excellent and the Omni Air Over Pants V2 is another good example. One big draw for Pilot has been “bang for the buck”, although these are relatively standard over pants. Offering another color option would be helpful, as would increasing the reflectivity. A pocket pass-through so I can reach inside to my jeans when wearing these as over pants would also tick that last “want” box for me. On the plus side also however is the ability to attach the Pilot V-Brace suspenders (review) and, of course, the included REISSA liner. And the fact that the Omni Air Over Pants V2 can mate directly with Pilot jackets is another bonus — and the Pilot jackets also offer very good value. Jeff, I ‘m sorry this response is coming so late. I never received a notification about this ( that’s why I’m looking at all my reviews now). I imagine at this point you chose a way to go but as a follow up I’d say you were leaning the right way. I would have done as you suggested and gone with the liner/mesh pants combo as it is more versatile. Of course for rain I would keep a set of Froggtoggs with me to put over the pants. The omni pants really a re better suited to colder temps and they don’t breathe much so they can become stifling if it gets warm.